Nani is riding the crest wave of success. After ringing in the New Year with a super blockbuster Ala Modalaindi, the actor is working with Telugu cinema's top notch director S S Rajamouli on Eega and has stepped into Gautham Menon's untitled trilingual film where he is playing the lead role in Telugu opposite Samantha (she is cast in all the three languages, Tamil, Telugu and Hindi). 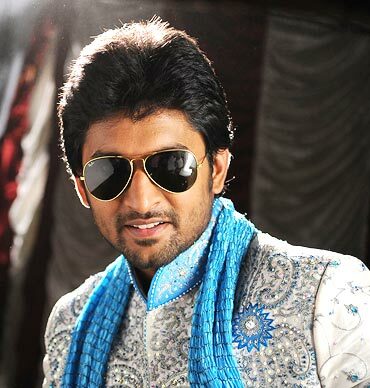 In this exclusive chat with Radhika Rajamani, Nani talks about his film Pilla Zamindar, which is due to release this Friday. What made you choose the script of Pilla Zamindar? It was different from what I have done before. The role has a wide range of emotions to portray, shows different shades of an actor. It's a beautiful script. It will be like a Munnabhai film -- entertaining yet with an undercurrent of good things. Everyone can enjoy the movie. It's about a city kid, a rich brat, who has to go to the village on account of certain circumstances and the difficulties he faces there. Will we get to see the comical side of you? The first half is funny, so one can see a lot of the comical side. The second half has touching moments. So, the film has both extremes. Did you have scope to perform well? Yes, totally. When it's challenging, it's fun to work. I enjoyed doing it. The best part is, till the interval you think you have come for a nice, fun film. It's a good film. You have two heroines, Haripriya and Bindu Madhavi, for company. How was it acting with them in this film? Both know Telugu. While Bindu Madhavi is a Telugu girl, Haripriya's dad is a Telugu. Since both know the language, it makes the job easier. Both are good actors. In fact, I would say they are characters instead of heroines in the film and they are part of the story. It was comfortable acting with them. When everything falls in place, the experience becomes memorable. How was it being directed by G Ashok? He is a very sensitive director who observes small things. What I liked about him is he loves the Telugu language. There's a scene about it too. It is a proper native Telugu film. The film has turned out better on screen than in the narration. Selva is one of my best music directors. In fact I liked his music in the original of Bheemili... i.e Vennila Kabaddi Kuzhu . Background score (re-recording) is Selva's forte. He is brilliant at that. I have never seen anybody like him. In Pilla Zamindar there was a lot of scope for re-recording and he proved us right by doing a good job. 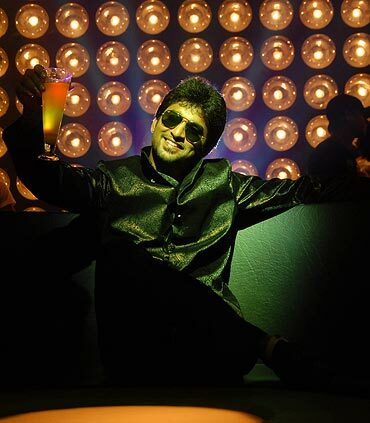 How was the overall experience of acting in Pilla Zamindar? It was memorable. There were limited characters in my previous films. Here there were more. We shot outdoors also. We used to meet up and have a good time. Pilla Zamindar is a fun film. I enjoyed working in it. You have done half-a-dozen films so far. How does it feel to be in the industry? Everything is good and healthy. There is nothing to complain about. What was it like working with Rajamouli in Eega? It's some other experience. He has finesse and is a perfectionist in getting what he wants as a director and he will go to any extent to get it. He is down to earth and a wonderful human being. In fact, his whole team, right from him, his wife Rama and others, gives positive energy and they don't make anyone feel small. You have now stepped into Gautham Menon's film. How does it feel? It feels great. It has been a childhood dream to work with him. I am very happy. I will get to learn a lot of things from the two films I am doing. Your Ala Modalaindi was a huge hit. How did you feel about it? I am very happy. The whole team thought it would be a good film but it turned out to be a bigger hit than we expected. That boosted our confidence a lot. It showed that if we do what we believe in, it will work. We could enjoy the success even more. Besides Eega and Gautham Menon's film are you doing any other Telugu projects? I will be doing a film with Krishnavamsi immediately after Gautham Menon's film.